An evening bat that stopped by Save Lucy headquarters for a brief stay. Hi everyone! I hope you all had a good week. I am very excited because this weekend I am going camping! Hopefully I will see a lot of critters (just no horrible spiders, please!). I am going to be close to the beach, so with any luck, I’ll see some dolphins playing in the ocean. But, what I really think I’ll see are some little bats! I am going to Delaware, so I thought it would be fun to talk about one of their bats… it turns out they have the same bats as in Virginia. Since they don’t really have bats that we don’t have here, I thought I’d research one that I don’t know anything about. I found a cool bat called the Evening bat. According to the maps, we have Evening bats here, but I don’t think I’ve ever seen one. They have dark brown fur and black ears. They live in the forest and are almost never found in caves. Hopefully that little fact will help protect them from white-nose syndrome. 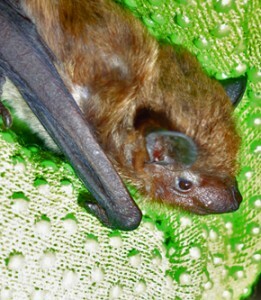 Evening bats form colonies in hollow trees, behind loose bark, and sometimes in buildings and attics. They wake up after dusk and eat small nocturnal insects like flying ants, Japanese beetles and moths. One thing that I thought was very interesting is that these bats migrate hundreds of miles south. And, only the females migrate back up north! The males stay in the southern part of the range. So all of you who have seen an Evening bat up north, you’re only seeing females. Evening bats are social and migratory. They roost in colonies of around 30 individuals. In October, females in northern populations migrate south. One individual was found 547 km south of where it was banded. Interestingly, males do not follow females to their northern maternity colonies in the spring, but stay in the southern portion of the range throughout the year. Maybe I will see an Evening bat while I am camping! I wish I could have the fun experience you had!